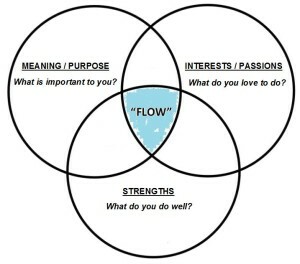 In this Venn diagram there are three intersecting circles where your strengths, values and passions might be written. In the circle on the bottom are the things you do well – the many strengths that you have, the things that people compliment you on, and the things about yourself that you might feel most proud. In the circle on the top left are the things that are important to you – your values, the meaning or purpose in your life. It could be love, service, supporting a cause that you feel strongly about – there is no right or wrong here. It’s what drives you. In the circle on the top right are the things that you love to do – your interests, your passions, and for those with ADHD, sometimes the things that you find yourself doing instead of what you set out to do. These are the things that you would do for free, but hopefully get someone to pay you for. The place where the circles intersect is where people are most happy, at their best and most successful … and this is where our ADHD challenges don’t show up as readily, if at all. Think about it: You are doing what you love to do, you are really good at it and it’s important to you. You are happy. You lose track of time. You are rocking it, whatever “it” is. And it feels good. Have you ever been on the field and just zoned in on the ball, perhaps surprising yourself or others about how focused and determined (and successful) you are? Have you ever been visited by your muse when you are doing something creative, and the words or images flow seemingly without effort? Positive psychologists would call this the state of “flow” but you might call it “being in the zone,” “totally immersed” or “in the moment.” It’s this place where you are obviously at your best – it’s no coincidence that this is also the place where your “ADHD shadow” is the smallest. You might call this high noon for the ADHD shadow, where the shadow exists, but it isn’t very apparent to yourself – or to others. 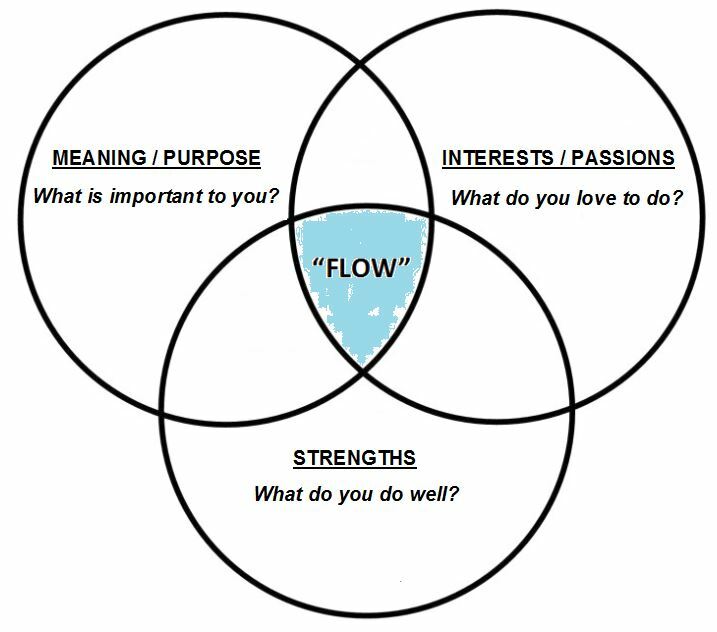 So recognizing that we all have our moments of flow, the question is: How can arrange our lives so that we are more engaged, more successful, and happier more of the time? What is important to me? What do I value most highly? What are my strengths? What do I do particularly well? What really interests me? What do I feel passionate about? The answers to those questions will help you find ways to have more “in the zone” moments where you are at your best … and able to do your best. And, of course, if we can be of assistance to you as you strive for more of those positive moments, contact us at info@FocusForEffectiveness.com.